Most skiers and boarders I know are keenly aware of what climate change is already doing to our winters. If you read anything about the climate science it’s fairly self evident that we are in for shorter and more erratic winters, unless we take serious action to reduce emissions now. 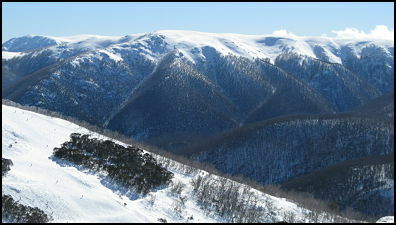 For instance, check this recent report into snow falls in the Australian Alps. That’s why these comments are so tragic, coming from a long term player in the winter sports industry …. If your income came from running a large ski business, do you think it would be worth tracking what trends are happening in your industry? And if anyone and everyone was saying that climate change was going to impact on the future and possibly even the viability of your business, do you think that maybe you might look into what’s coming? Obviously not everyone works that way. Here’s some choice quotes from Mick Klima, co-owner of the Rhythm Snowsports megastore in Cooma, courtesy of Powerhound magazine. (Does climate change worry you?) “I’m with [British politician] Lord Monckton on that one, mate. That guy’s got it together. It’s a scam. It’s the new religion. It’s become too politicised and too emotional”. Which does beg the question, does ignoring it because its ‘emotional’ make it go away? “I’m not into the masses being manipulated by fear. There’ll always be something that politicians use to manipulate the way the public’s money is spent”. Yeah, well, good luck with that one Mick. For some analysis of Lord Monkton’s approach to climate science, check here. Nice article mate, have you been skiing this winter? Looks like Mick might be on the money! Yeah, its certainly been good so far. And hopefully more on its way this week.